The allure and beauty of amber is obvious, its charm is unmistakable, and it’s been that way for thousands of years. But what makes amber so dramatically different from other precious stones? Is amber even considered a stone? Let's answer some questions about amber to find out! It seems unbelievable, but scientists actually argued a lot about it! Some thought it was some kind of a mineral or ancient honey that solidified with time. In the 19th century the scientists finally found out that amber is actually fossilized tree resin. But though now the scientists knew what amber was, they still had no idea what kind of trees produced that resin. It was clear though that not all kinds of trees could produce resin that could turn into amber. In fact, most resins are chemically unstable, so they simply decay with time. So, at first scientists thought that only one kind of ancient pine called Pinites Succinifer produced amber, but later they found out that there was a whole variety of ancient pines that grew all over Eurasia and even in Greenland! At the present time, there is only one kind of these ancient pines left (it is called Sciadopitys Verticillata), and it grows only in Japan, but they used to be everywhere. Speaking from the chemical point of view, amber consists of carbon, hydrogen and oxygen and over 40 other components including succinic acids. That's why it is also called succinite. Amber comes in a wide range of colors: from bright yellow to dark brown. Since Baltic amber is pretty old, people often find pieces of amber with various enclosures like water or air bubbles, plant seeds and even insects! Amber is made from fossilized tree resin. Resin is not the same thing as tree sap! Resin gets secreted by a tree in response to injury as a way of preventing further damage. Resin is also secreted by trees as a result of rapid changes in climate or temperature. As the resin oozes down the tree, it picks up bits of plant and animal matter, which, if the conditions are right, will be trapped when the resin fossilized. Eventually, after a little time passes (a few million years or so), you could find a piece of amber washed ashore that, after being crafted and polished, is ready to be set into a unique piece of amber jewelry. The substance it forms is very light. Because it weighs so little, this natural beauty makes great large amber jewelry pieces. Most amber used today is between 30-90 million years old. Amber deposits have been found that range between 360 and one million years old. The oldest known amber, found on the Isle of Wight, is 120 million years old. So where does this Russian amber come from? The right term for it is actually Baltic amber since it can be found all over the Baltic region, including Denmark, Germany, Poland, Latvia, Lithuania, and the Russian Kaliningrad oblast. 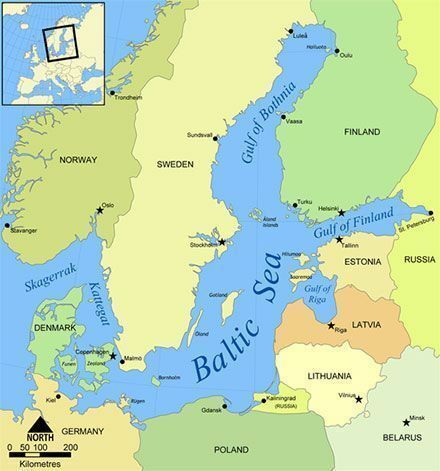 The Baltic region actually has the largest known deposit of amber dating from about 40-45 million years ago. Sure it is not the oldest kind of amber in the world, but its beauty is simply stunning. By the way, people mostly use the amber that is about 30-90 million years old. Some of the oldest deposits of amber date from about 120 million years ago, but they are very rare and are not found on the Russian territory. Amber was known and used since the New Stone Age. The archeologists find amber beads even in the Egyptian pharaoh tombs dating back to 3400-2400 BC. Amber beads were found at the place where the archeologists excavated Troy and the scientists found out that these beads were actually made from amber that came from the Baltic coast around 3000 BC. In Greece and in the Roman Empire amber was called "northern gold". During the Middle Ages the demand for amber was so high that only authorized people could collect amber. Anybody who tried to collect amber without a special permission was executed. You would probably think that things have changed now and amber has become much cheaper. Well, not exactly. Do you know that even now certain pieces of amber can cost around 1,000 USD? And if there are inclusions in a piece of amber its price can go up to 100,000 dollars. The thing is that since amber is an ancient organic material its inclusions are extremely valuable and thus very expensive. People find amber with the species of different extinct plants, insects and animals inside. In fact, Wikipedia says that "Baltic amber includes the most species-rich fossil insect fauna discovered to date." What is amber used for? First and foremost, for jewelry: necklaces, rings, bracelets and more. You can find an extensive collection of exquisite amber jewelry in our store. Amber has also been used for interior decoration. The most famous example of amber interior is the Amber Room in the Palace of Ekaterina the Great in Tsarskoye Village. Before the room was lost during the World War II it was often referred to as the eighth wonder of the world. In 2003, the room was reconstructed and can now be seen in the Catherine Palace in Saint Petersburg, Russia. Here are some pictures of the new amber room, reconstructed from black and white pictures of the lost wonder. It is splendid. There is definitely nothing like that in the whole world. The fact of the matter is that people have been making necklaces in this beaded style for hundreds, if not thousands of years. The timeless charm that an amber beaded necklace can carry is sure to never go out of fashion. Just like a gorgeous strand of natural pearls, these amber bead necklaces add that simple touch of elegance to your entire outfit, while not overpowering your own radiance. We carry round beads of amber necklaces in butterscotch amber, cherry amber, honey amber, and sometimes cognac amber. Each one of our round bead necklaces has been imported to us directly from the regions surrounding the Baltic Sea, as we only carry Baltic amber here at The Russian Store. In order to make these necklaces appear so flawless, each is given extreme care all throughout the stringing process. Our artist’s attention to detail is what really separates our necklaces apart from the others. These round bead amber necklaces were all strung by hand, which gives the artist an intimate chance to get to know each amber bead. If something is not up to standard with a particular bead, they will simply toss it aside for another project and start the entire bead making process over. This is a time consuming task, but since we are dedicated to bringing our customers only the very best, we would have it no other way. 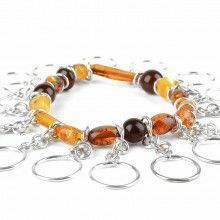 Check out our complete selection of amber beads necklaces today! Our collection of incredible natural-cut chunky amber necklaces are truly works of art. In order to create these unique necklaces, the artist must carefully select each raw stone that they want to use for the necklace. Typically, chunky amber necklaces are made from different colored amber. For instance, most of our chunky amber necklaces here are made with honey amber, cognac amber, and butterscotch amber stones. After each stone is selected it must be washed before it can be cut by hand. The free-flowing organic cuts that the artist makes are intended to follow the natural curvature of each stone. Doing this allows for greater workable surface area while creating an nonuniform appearance. No two stones on these necklaces are shaped exactly the same. Some are more round and some are more flat, it just depends on how it came out of the ground. Next after each amber stone is given a rough cut, they are polished by hand to a glossy finish to bring out the inherent beauty of each amber stone. Now, here comes the tricky part; each amber stone must have a hole drilled through it in order to hang it on a string and make it into a necklace. Amber is brittle and soft so a special drill and drill bit must be used. Even with these special tools, sometimes the amber bead shatters and the artist must start the whole process over again. Unfortunately, this is an unavoidable aspect of amber jewelry making, especially when it comes to making strand necklaces. Most of our chunky amber necklaces are not set in any sort of metal; it’s all amber. 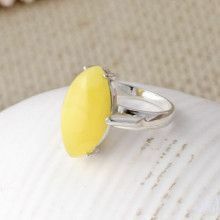 Amber is a majestic and beautiful stone all on it’s own, but we love to combine things in the world of jewelry, right? Gold and diamonds. Rubies and emeralds. Amber and silver. They go together like peanut butter and jelly. Here at The Russian Store we only deal with authentic Baltic amber and 0.925 sterling silver. Each silver and amber jewelry piece that you see here meets these basic guidelines. In addition, our amber and silver necklaces are truly unique and many of them are one-of-a-kind pieces that you will never find anywhere else. From elegant and elaborate floral designs to simple hanging pendants, we have the perfect necklace for you. You can dress these necklaces up, or dress them down. 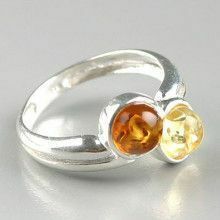 The combination of amber and silver is so versatile that everyone should own a jewelry item with it! The ancient art of gemstone carving goes back thousands of years. Here at The Russian Store our fine line of amber cameo, or amber intaglio jewelry pieces are each made by hand by artist who have mastered the old tradition, but who have also added some modern flavor to the art form. The term cameo refers to any gemstone that has been carved. Typically, artists will start with a large stone and gradually chip away at it until they have an image in relief. Cameos will pop out at you. You can run your hand over a cameo and feel the raises that have created the image. This image is classified as a positive image as the negative space was removed to create it. Conversely, an intaglio is a negative image created by removing the positive space in order to create an image. The fact of the matter is that all of our pendants that we sell here at The Russian Store are all amber intaglio pendants. We refer to them as cameos sometimes because many people are unaware that there is a difference between these two terms. Our amber intaglio pendants are made by carving the back side of a translucent amber stone in order to create an image that can be seen through the front of the stone. Our intaglios are so well done that it gives the appearance that the image is actually inside of the amber stone. 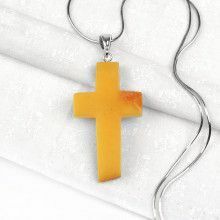 We have some classic designs and some more modern designs, so you are sure to find an amber cameo pendant that you love. Pick out your favorite pendant to create a perfect amber intaglio necklace today! What else is amber famous for? Hippocrates (460-377 BC) wrote about different medical characteristics of amber. His works were used by scientists and doctors in the Middle Ages. In ancient Rome people used amber not just as adornment, but as a means of protection from sore throat, ear and eye diseases and stomach illnesses. They even believed that amber could cure mental disorders. Some people believe even now that amber can draw negative energy and illness from the person wearing it. It can restore the wearer's health and wellbeing. Moreover, you have probably heard about amber teething necklaces. They say that these necklaces literally work wonders helping children to ease the pain during this hard time of their lives. The succinic acid inside amber is a natural pain reliever. Besides, it acts as an anti-inflammatory agent and has a soothing effect on the central nervous system. That's why the demand for amber teething necklaces has been steadily growing as more and more people see how much these necklaces help their children. Amber also has regenerative and restorative properties, so small pieces of amber are also used in skin care products. Sometimes pieces of amber have what are called inclusions in them. Inclusions refer to the bits of organic material, such as twigs, leaves or, often, insects that were trapped in resin by the flowing tree sap millions and millions years ago. These objects are perfectly preserved in their lustrous prison, and they have provided a window to the past for the scientists and amber-lovers alike. The inclusions only add to the infinite variety that characterizes amber. Today amber continues to fascinate and intrigue everyone who gets in contact with it. In order to make an amber adornment, each piece is individually hand-carved and polished to bring out its inherent beauty, and fashioned into unique jewelry. No two pieces that we sell here at The Russian Store are exactly alike. Our collection of loose amber stones contains several pieces with insect inclusions. Some stones even come complete with a box and magnifying glass, making them exceptional gifts. We also have insect inclusion amber jewelry, which is extremely rare and hard to keep in stock. Please check back often, or feel free to contact us and stay informed! Amber floats in salt water but sinks in fresh water. Unlike the minerals and glass, amber is warm against the skin. When amber is burning it smells like pine. In the Roman Empire, especially during the reign of Emperor Nero (54-68 AD), a small amber statuette was more expensive than a good slave. The oldest amber dates back to 320 million years ago. Amber comes in more than 300 different shades! The most common colors are honey, green, cherry, cognac, citrine, and butterscotch. The Roman rulers valued amber so highly that they started wars in order to conquer areas that had large deposits of amber. In ancient China people would burn amber during big celebrations. Thus a host could demonstrate his wealth and at the same time show respect to the guests. Martin Luther wore a piece of amber in his pocket because he believed it could protect him from kidney stones. The term "electricity" actually stems from the Greek word "electron" which is the Greek name for amber because it can store static electricity.